PLANO, TEXAS — SEPTEMBER 19, 2016: The Swych Mobile Gifting Platform, along with the newly unveiled Swych GiftBotTM , won the prestigious Best of Show award at the Finovate Fall 2016 conference in New York. Swych was among 71 Fintech companies selected to present at this year's conference held September 8 and 9. Swych co-founders Robert Sabella and Deepak Jain present at Finnovate 2016. 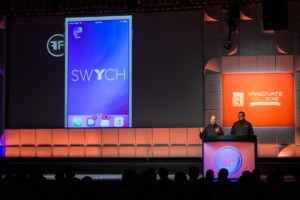 Finovate attendees previewed Swych’s new patent-pending GiftBot, a first-of-its-kind personal gifting assistant that makes gifting possible from the apps that consumers use most often such as Facebook, Skype, and iMessage. The GiftBot is yet another compelling addition to the unique user experience offered by the Swych mobile gift card app currently available for both iOS and Android operating systems. Swych co-founders Deepak Jain and Robert Sabella showcased the simplicity of mobile gift card transactions using both GiftBot™ as well as the mobile app along with the unique experiences offered by the service such as cash bonuses and instant “swyching” of a received gift to any merchant brand. The Swych Artificial Intelligence-enabled GiftBot provides personable conversations with users while using information from their social and professional networks to complete digital gift transactions in a simple chat session. All gift cards received from the app or GiftBot, can be redeemed, saved, or “swyched” with more than 100 popular brands offered. Discounted gift cards are also available for sale within the app so users can save on their favorite retailers and brands. Users can purchase gift cards securely using Apple Pay, Android Pay, and PayPal directly within the app and save gift cards to their Apple Wallet or Google Wallet. Plus, every purchase earns users rewards points that can be used to buy additional gift cards. Swych’s patent pending mobile gifting platform enables users to send “Swychable” gifts from their mobile device that can be instantly redeemed for electronic gift cards from more than 90 popular brands. Swych users can instantly buy, send, re-gift, upload, Swych and redeem gift cards conveniently from their mobile device. Swych is a private company funded by seasoned angel investors from the banking, financial services, payments, gifting, telecom and enterprise computing space. Swych’s headquarters is in Plano, Texas, with offices in San Francisco, California. To download Swych click here.